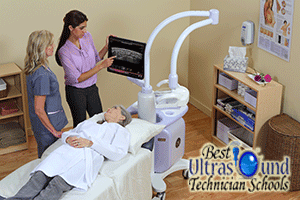 Although there are no accredited programs for Ultrasound Technicians in San Antonio, there are 19 programs within the state of Texas, five of which are within 200 miles of San Antonio, mostly in the cities of Austin and Houston. A listing of accredited schools for Diagnostic Medical Sonography can be found on the Commission on Accreditation of Allied Health Education Programs website. The programs available near San Antonio are 1-2 year programs that offer either an Advanced Technical Certificate or an Associates of Applied Science Degree, preparing the student to sit for the American Registry of Diagnostic Sonographers (ARDMS) exam. Graduates that receive an Associate’s Degree of higher can choose to sit for the American Registry of Radiologic Technologist (ARRT), as well. The institutions offer concentrations in Echocardiography, Vascular Sonography, OB-GYN Sonography, or General Sonography. Prerequisites of college-level algebra, physics, communications, human anatomy and physiology, and medical terminology are required to be accepted into most of the programs. The general coursework will include basic patient care, medical ethics and law, and pathophysiology. Also included in the curriculum, the student will learn about acoustic physics, ultrasound principles and the ultrasound instrumentation. By learning to interpret the sonographic images, the student will be prepared to recognize abnormalities, and, under a qualified physician’s supervision, diagnose disease. Students will also be required to take part in clinical rotations in addition to their coursework in order to receive hands-on training. Diagnostic Medical Sonographers in San Antonio make an average annual salary of $61,000, with the national average annual salary of $70,000, according to Indeed.com. The projected growth of the industry by 2022 is expected to be 39%.